Last time I was in LA I got to experience Venice Beach, walk on Santa Monica pier and even caught a glimpse of MADIBA, the Nelson Mandela tribute by David Flores. I also managed to visit my favourite tattoo crew at Deer's Eye studio in Santa Fe Springs. I'll be in LA again for a few days next month and though it's a business trip I'm hoping to catch up with a couple friends when I'm not working, and get across to the Natural History Museum to see TATTOO. 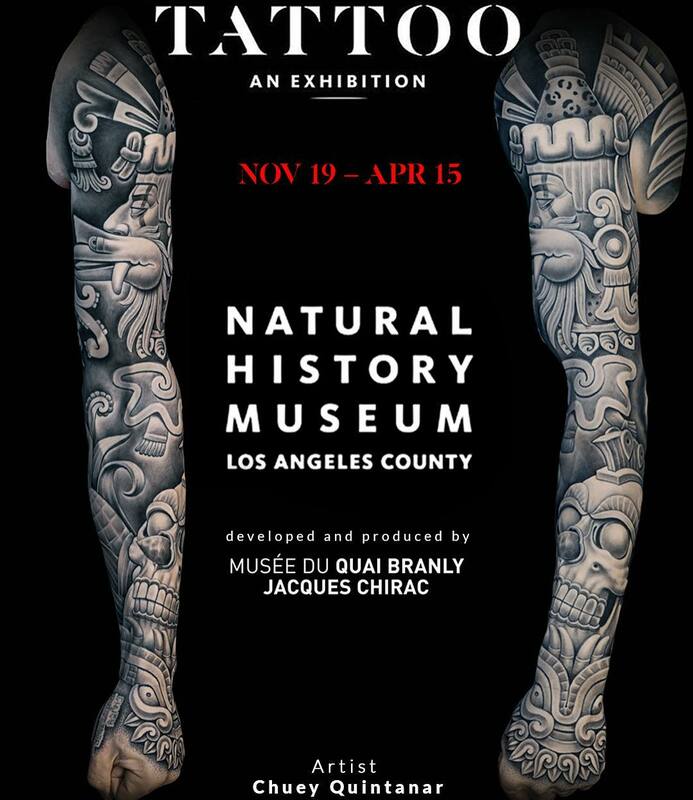 Tattoo explores more than 5,000 years of history, culture, and art connected to ink through specially commissioned, tattooed silicone forms; hand-drawn art; videos of tattoo ceremonies; interview footage of luminary practitioners; and the technology and tools of the trade—all while also spotlighting the vibrant tattoo scene in L.A.
“As a Museum of, for, and with L.A., and committed to exploring the region’s nature and culture, we are honored to present Tattoo in Southern California. 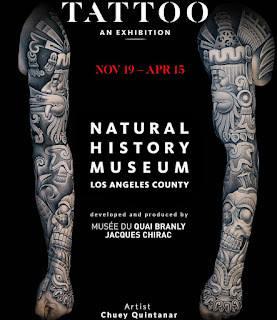 This is the birthplace of several pivotal tattoo movements, including the Long Beach Pike scene and the black-and-gray style,” commented Dr. Lori Bettison-Varga, President and Director of NHMLA. I've seen work by some of my favourite LA artists at the "Time: Tattoo Art Today" show in London back in 2014, but being able to view work in their own back yard is very exciting. 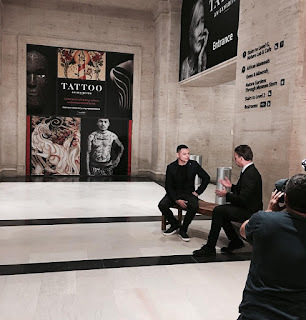 I'm particularly interested in seeing what tattooist Chuey Quintanar (above) has submitted. I'm blessed to have spent time with Chuey in and out of the chair, and am so very pleased to know he is part of this monumental exhibition. I will be keeping it low key but If you can think of anything else relatively easy to see or visit outside of working hours please let me know. Thanks for sharing this article with us.keep posting!! !